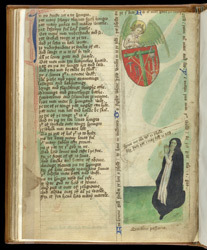 With verses of 'The Desert of Religion' on the left, the right side of the page bears a picture of a nun praying in the 'desert'. She looks upward at an open scroll, inscribed, 'Arm me Jesus with your shield,' referring to the caption below, 'the shield of the passion.' Above her, an angel holds a red shield bearing a green cross around which are arranged the instruments of the passion (flail, sponge, spear, crown of thorns, nails, etc., used in Jesus' crucifixion). The instruments of the passion were revered relics and objects of intense devotion, images of them functioning as aids to spiritual experience. The nun's black cape, worn by Benedictine monks and nuns, suggests that the book was made for a Benedictine community.